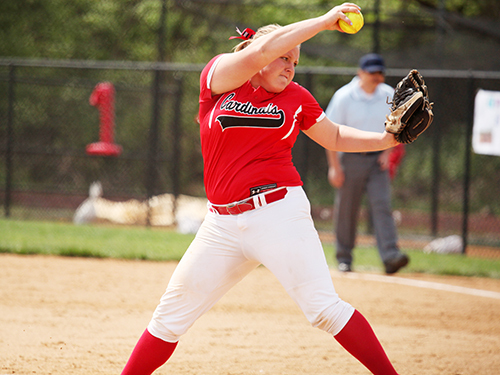 Sophomore pitcher Megan Colline gave up just 2 runs in her complete game win in game 2 of the doubleheader. The softball team at the Catholic University of America battled to earn an important Landmark Conference sweep of the Drew University Rangers on Saturday, April 16th. The Cardinals took game one by a score of 3-0, and three runs were enough to take game two, 3-2. Catholic moves to 7-3 in the Landmark Conference and their overall record now stands at 19-7. Only eight runs were scored by both teams in the doubleheader, but the Cardinals came out on top in both of the contests. Out of the 14 innings played at Catholic’s home field on the sunny afternoon, there was just one extra base hit from sophomore Megan Colline in game one. The other 17 hits on the game were all singles. Colline ended up touching all of the bases in that special hit, in a crucial home run in game one. Colline’s home run was the source of the three runs that Catholic University put on the board in the first game. The three-run bomb over the left field fence broke a scoreless tie in the third inning, and the lead was plenty for freshman pitcher Kelly Lynch. The rookie phenom impressed again in a complete game shutout, giving up just four hits and striking out 5 Drew batters. She is now 10-4 on the year, leading the pitching staff in wins. Junior shortstop Becky Hoisl also performed in game one, getting on base each time she came up to bat as the leadoff. Hoisl went 2-2 with a walk, and added two stolen bases in the victory. Colline was called upon in game two to take the mound and start for the Cardinals. The sophomore gave up one unearned run in the first inning, and Drew jumped out to their first lead of the afternoon. It was short-lived though, as the Cards responded with three runs of their own in the bottom half of the opening frame. Kristina Lozupone and Erin Adams each got a hit, and both eventually scored with the help of 2 errors by the Rangers defense. The lead was enough for Colline. Her defense struggled behind her, recording 5 errors in game two, but she navigated through for the complete game win. She evaded a huge threat in the third inning when she got out of a bases-loaded, no-out situation. The right-handed thrower induced a force out at home for the first out and then started a 1-2-3 double play to end the inning unscathed. The team will play a doubleheader at Stevenson on April 23rd, starting at 1 PM.